Milwaukee-based trial and litigation firm Gimbel, Reilly, Guerin & Brown is celebrating its 50th anniversary. Tagged with: Frank Gimbel Hupy and Abraham Michael Hupy Murphy Desmond Reinhart Boerner Van Deuren Who's Doing What? Quarles & Brady recently announced that Isaac Roang received the Next Generation United Performing Arts Fund Leadership Award. Tagged with: DeWitt Ross & Stevens Godfrey & Kahn Murphy Desmond Probst Law Offices Quarles & Brady Who's Doing What? The only thing Kathy Brickl doesn’t do for her firm is practice law. Wisconsin residents who see their property lose value following government action may soon have better chances of getting compensation. Ogletree, Deakins, Nash, Smoak & Stewart has joined the LGBT Chamber as its newest Gold Founding Member. Tagged with: Bruce Rosen James Ledvina Johanna Allex Jordan Corning Kurt Goehre Linda Benfield Malinda Eskra Murphy Desmond Robert Romashko Shawn Lovell Stafford Rosenbaum Steve Krueger Thomas Griesheimer Who's Doing What? Billie Jean Smith, a partner in the Michael Best & Friedrich Intellectual Property Practice Group, will be honored with the Opus College of Engineering Service Award at the upcoming Marquette University Alumni National Awards Weekend. Making sure you’re on track to become partner is somewhat a matter of putting yourself on that path. A construction contractor and the city of Middleton together scored a victory in court over the Associated General Contractors of Wisconsin, but that result cost the company about three times as much. A Kenosha landowner is urging the state Supreme Court to reject the Wisconsin Department of Transportation’s attempt to avoid paying damages after removing a driveway. A Wisconsin resident is not entitled to a conceal-carry permit because his conviction for disorderly conduct is considered a crime of domestic violence, the Court of Appeals ruled Thursday. The six largest settlements reported to Wisconsin Law Journal in 2013. Retired Outagamie County Circuit Court Judge Harold Froehlich received the Lifetime Jurist Achievement Award, and Milwaukee County Circuit Court Chief Judge Jeffrey Kremers received the Judge of the Year Award from the State Bar of Wisconsin in November. Tagged with: Godfrey & Kahn Harold Froehlich Jeffrey Kremers Mario Mendoza Michael Best & Friedrich Murphy Desmond Quarles & Brady Sherry Coley State Bar Who's Doing What? Murphy Desmond SC opened an Appleton office to serve the Fox Valley region. New Securities and Exchange Commission rules that go into effect Sept. 23 offer benefits, but require additional duties for securities issuers. To answer your question, Mr. Shakespeare, there’s a lot in a name, especially when it’s associated with a law firm changing its name, even slightly. Rachelle Hart was named senior vice president, general counsel for Aurora Health Care. Tagged with: Davis & Kuelthau Fox O’Neill & Shannon Habush Habush & Rottier Hawks Quindel Jeff Peelen Murphy Desmond Neider & Boucher Quarles & Brady Who's Doing What? Harvey Wendel, of Murphy Desmond SC, was honored by the Dane County Bar Association as the first recipient of an award in his name. Tagged with: Dane County Bar Association Murphy Desmond Quarles & Brady Ruder Ware von Briesen & Roper Who's Doing What? 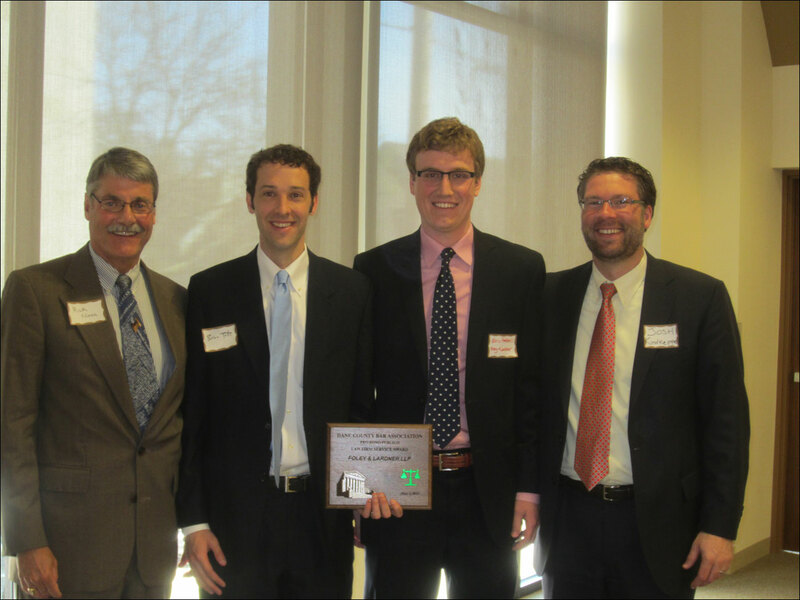 The Dane County Bar Association presented three awards for outstanding pro bono work during a Law Day celebration May 1. Tagged with: Dane County Bar Association Eastern District of Wisconsin Bar Association Foley & Lardner Godfrey & Kahn Habush Habush & Rottier Murphy Desmond von Briesen & Roper Who's Doing What? Mario Mendoza has a unique perspective on Madison’s Concerts on the Square summer music series. In advance of its 154th annual Meeting and Luncheon on June 12, the Milwaukee Bar Association announced the winners of its annual awards. Tagged with: DeWitt Ross & Stevens Foley & Lardner Gonzalez Saggio & Harlan James Peterson John Daniels Murphy Desmond Nathaniel Cade Perkins Coie Quarles & Brady State Bar The Schroeder Group Who's Doing What? Milwaukee County Sheriff David Clarke’s decision to hire a private attorney without first consulting the county could end up costing him more than $55,000.